Hope Restored Thrift Store is stocked with donated clothing, furniture and home goods. 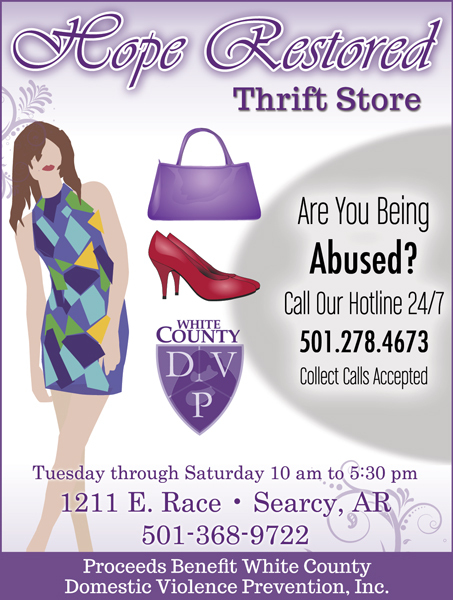 It offers a unique opportunity for shoppers to benefit the only domestic-violence shelter in White County, Hope Cottage, through their purchases. Until now, the organization has gotten by on grants and donations but those have become very hard to obtain. Hope Cottage, a shelter for women and children who are victims of domestic abuse, opened Hope Restored Thrift Store to replace the money not coming in from grants. Visit Hope Restored today and browse through clothing, furniture and household items or drop off your tax deductible donations. Hope Restored is located at 1211 Race Street in Searcy. The store is open from 10 a.m. to 5:30 p.m. Tuesday through Saturday. New merchandise is displayed daily! Visit Hope Restored's Facebook page.